I may be a little bit uninformed as I was busy with a couple of stuff these past years, but this seems like a very interesting piece. Would it be worth it to buy from their wall in the store or through bricklink? Has someone used it in a MOC and what are your experiences with this piece? It's become one of the most popular parts around for Castle (and buildings in general), I think it'd be well worth it to pick up a bunch from the wall, as they're not the cheapest parts on BrickLink. Agreed. You can never really have enough of these guys. Yes buy them...if they are in a color you will use and want. 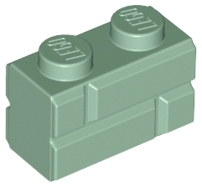 I won't be 100% happy until there is a 1x1 or corner piece with the brick brick on it. We definitely need both a corner brick (L-shaped brick, 2x2 with cutout - whatever the official name for that is) with brick facing along both outer faces and also a 1x1 brick with brick facing along two adjacent faces. That would let us make true brick buildings without breaking the pattern.